Recent, more rigorous changes to academic requirements for student athletes makes it essential to provide these students with the skills and strategies they need to succeed academically and maintain eligibility. 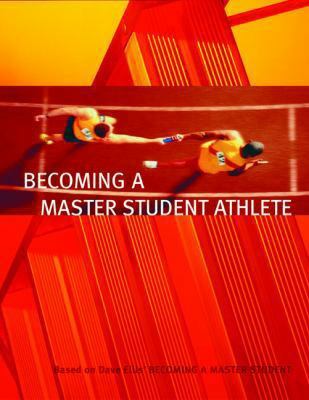 This new, First Edition Student Success text, based on the principles of the best-selling Becoming a Master Student, was developed specifically to meet the unique challenges faced by student athletes in succeeding both on and off the field. Becoming a Master Student Athlete helps student athletes balance the demands of academics and athletics by focusing on issues such as the pressures on time, body, interpersonal relationships, and major/career-oriented decisions. With hands-on involvement from athletic academic advisors and coaches, every sentence in this new first edition has been tailored to meet the needs of student athletes. Exercises and activities have a hands-on, "do-it" approach for kinesthetic learners. Articles, examples, Master Student Profiles and the art program are relevant and engaging for the student athlete. Most importantly, this text helps students prepare for life beyond college by addressing the importance of selecting a major and considering career options, while underscoring how the skills that help athletes excel on the field can be applied in the classroom and transferred to the workplace. Master Student Map (Metacognitive Application Process) feature provides an organizational framework that introduces each chapter and acts as a common theme throughout the text to guide students in monitoring thinking and learning. A reasoning model based on the Learning Styles Inventory, the map helps students understand why the chapter matters, whatis included in the chapter, how they can use the chapter, and what to think about as they read ("As you read, ask yourself what if..."). Master Student Athlete Profiles include Ken Procaciantti, Greg Louganis, Dot Richardon, Jim Abbott, Billie Jean King, Mia Hamm, Oscar Robertson, Sheryl Swoops, Dat Nguyen, Neil Parry, Wilma Rudolph, John Wooden. Twelve concise chapters accommodate the busy schedule of the student athlete. This 384 page book is 48 pages shorter than Becoming a Master Student, 11/e. A unique art program includes photos and illustrations relevant to the student athlete. Athlete-specific content, based on material from the best-selling Becoming a Master Student,11/e, has been revised, line by line, to tailor the tested concepts and strategies in BAMS to the specific needs of student athletes. Unique articles written by advisors, instructors, and coaches who have experience working directly with student athletes are integrated throughout the text. Examples include Connect to Athletic Resources; Academic Skills vs. Athletic Skills; Reading on the Road; Communicating with Coaches, Instructors, the Campus, and the Media; Hazing; and Jobs for Student Athletes. Expert assistance--The development of this text, including the writing of articles and activities, has been heavily assisted by involvement from our Advisory Board. The Advisory Board consists of advisors, instructors and coaches to student athletes--the individuals who best understand the needs of student athletes. Lead Faculty Advisor, Dr. Karl Mooney, is Senior Associate Director to Athletics at the University of Central Florida and a past President of the N4A (National Associate of Academic Advisors for Athletes).Master Students Staff is the author of 'Becoming a Master Student Athlete', published 2005 under ISBN 9780618493234 and ISBN 0618493239.